The PeaceJam Service Slam is an opportunity for participants from across the county to meet organizations and get involved in community service. The event took place Jan. 9 at Pine View in the Student Union, auditorium and green building. The Service Slam started at 8:30 a.m. and continued until 4:30 p.m. The day began with an appearance from Youth United for Human Rights, an organization that highlights awareness for the declaration of human rights and catalyzes the connections between rights and today’s youth. This was followed by two breakout sessions—a period when attendees of an organization spread awareness for their cause, and includes information on direct service opportunities. “It was a stressful experience, but helpful. It allowed me to further embed myself in the Sarasota community, and it was so great seeing everything come together after 6 months of work,” tenth-grader Lauren Yenari, head of the event, said. These organizations included Children First, CURE 2.0, Daughters For Life, Community Youth Development and Sarasota in Defense of Animals. Children First started off the event by bringing supplies and ingredients to the event to make homemade play dough that would later be taken back to the organization and distributed. CURE 2.0 helped participants write letters to women fighting breast cancer and to survivors of breast cancer. Daughters For Life taught people Arabic culture through common Arabic words and describing well-known dances. This was paired with practice in conversation to learn how to take action instead of being a bystander when people are labeled “dangerous” for their beliefs. Participants also learned how to successfully write an action plan for a community service project with Community Youth Development. The last organization in the breakout, Sarasota in Defense of Animals, brought dog toys to the event that were later sent to Nate’s Honor Animal Rescue. “This experiencewas an amazing way to express opportunities that students can help the community and even assist in global causes,” ninth-grader Michael Hampton, member of PeaceJam, said. At 1:00 p.m, a panel of speakers gathered and spoke of their causes and what they support. The panel consisted of Bob Connors, a WSLR peace and justice report radio show host, Brenna Wilhm, educational director of Embracing our Differences, Sarah Wertheimer, associate executive director of Embracing Our Differences and Joseph Newman, a 103 year old step-in radio show co-host involved in spreading awareness through multiple organizations. “The purpose of this occasion is to illustrate the need in communication, skills in the community, taking action, and united focus towards one goal,” PeaceJam sponsor and English teacher Bridgid Shannon said. After the presentation, Billion Acts of Peace had a breakout session of their own where they went over 10 important calls to action and passed out plans for participants to take home about being involved in your community. Then from 3:30 p.m. to 4:00 p.m. there was an action service with Salvation Army. 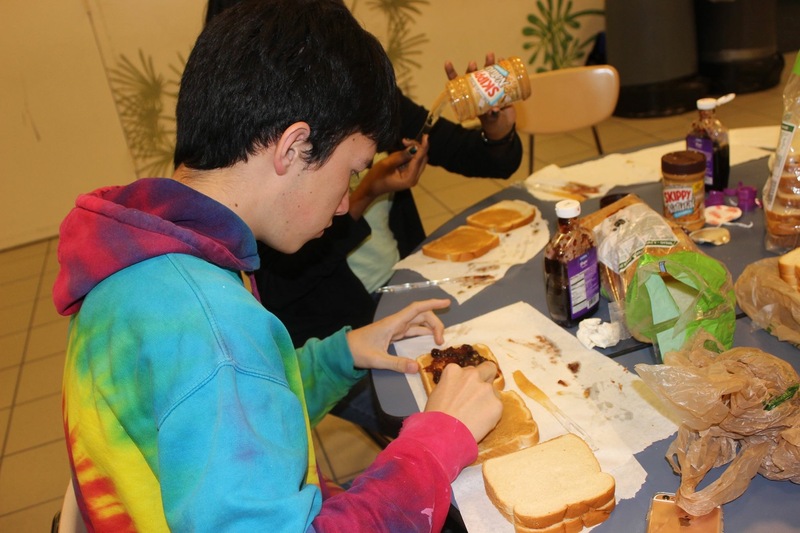 Together, the members of PeaceJam made 150 peanut butter and jelly sandwiches and also made plarn birthing mats. Plarn is a yarn made of recycled grocery bags. The mats are sent to Africa to be used by pregnant women to give birth in a sterile environment. The next Service Slam will be taking place next fall, where one can easily get involved in community service through the Service Slam, PeaceJam, or the organization Billion Acts of Peace. Billion Acts of Peace is sending out an interest form this spring for anyone who would like to participate. “This event gave me the opportunity to learn more about our community and what I can do to improve it. I also got to make new friends and meet important people that make a difference, which was pretty cool,” ninth-grader and new PeaceJam member, Bianca Carey said.